456 pages | 69 B/W Illus. As developed economies enter a period of slower growth, emerging economies such as India have become prime examples of how more can be achieved with less. Bringing together experience and expertise from across the healthcare industry, this book examines innovations that can bring about real advances in the healthcare industry. 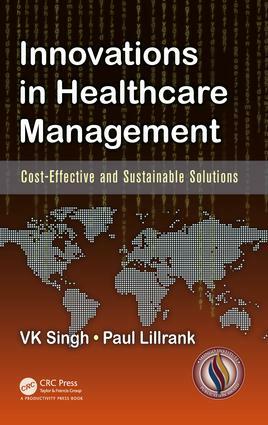 Innovations in Healthcare Management: Cost-Effective and Sustainable Solutions explores recent innovations in healthcare from a global and Indian perspective. Emphasizing the importance of Lean healthcare and innovation, it presents low-cost, high-volume solutions that improve access to care. Providing concrete examples of the five levels of innovation present in healthcare, the book presents new concepts, methods, and tools for advancing processes and operational flow. It includes case studies of actual results in healthcare innovation from three continents that highlight emerging global trends in healthcare system innovation. The book describes how to organize resources and flows so that given targets, such as cost, clinical quality, and patient experience, can be achieved with available resources. It also covers nontraditional ecosystems of innovation that move outside of expected technological innovations, such as innovations in social persuasion, rural health delivery, and the planning and design of hospitals. The book maintains a focus on key issues across the healthcare industry—such as access to care, demand creation, patient experiences, and data—to help readers implement new ideas and new models of delivery of affordable care in healthcare systems around the world. Dr. Vijai K. Singh retired as Surgeon Rear Admiral after 37 years in national and international assignments. He earned MBBS, Masters in Hospital Administration, Diplomate National Board in Hospital and Health Care Management, and M Phil. He was awarded a Distinguished Services Medal for services in Zambia by the President of India and commendation by Zambia. He had been deputy chief medical officer of the United Nations, adjunct professor of the Massachusetts Institute of Technology (MIT), Zaragoza, Spain, and consultant to the National Disaster Management Authority. He was president of the Academy of Hospital Administration, founder director of the International Institute of Health Management Research, chairman of the Health Care Division of Quality Council of India, and member of the International Group on Biosafety. He developed a European Foundation for Quality Management (EFQM) model for Healthcare in India released by Union Health Minister. Presently, he is Adjunct Research Professor at the International Health Innovation Center, Ivey School of Business, Canada, and Director of Healthcare Asia for Lean Healthcare Excellence-Simpler. He is a member of the National Public Health Committee of Confederation of Indian Industry (CII) and visiting professor of the Indian Institute of Management, Management Development Institute, and Public Health Foundation of India. Paul Lillrank has been a professor of quality and service management at Aalto University since 1994. He earned his PhD from Helsinki University in 1988 after postgraduate studies in Japan, where he studied quality management in Japanese industry. He has worked at Science University of Tokyo, the Boston Consulting Group, and Stockholm School of Economics. He has pioneered industrial management applications in health care and cofounded the Institute of Healthcare Engineering, Management and Architecture (HEMA) at Aalto, Finland, and the Nordic Healthcare Group (NHG), a consultancy. He has published in the areas of health-care operations management, technology transfer, service quality, and process analysis. He teaches regularly at the Indian Institute of Technology, Kharagpur.